Whether or not text messages and e-mails from the mobile phone are displayed depends on whether transmission from the mobile phone to the vehicle is supported. 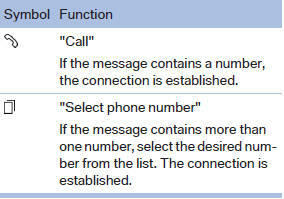 Text messages and emails may not be supported by the service provider, or the function may need to be enabled separately. After the mobile phone is first paired, transmission may take several minutes. Messages are only displayed in full length when the vehicle is stationary. Messages from the additional telephone are not transmitted. A symbol identifies the type of message. The message list can be filtered, when more than one type of message exists. 2. Select the type of message. Only e-mails from the mobile phone are displayed. Only text messages from the mobile phone are displayed. 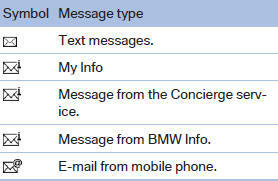 Messages from the Concierge service, My Info, and BMW Info can be deleted. 3. Select the desired message. 4. "Delete all messages" or"Delete service messages"
Calling the sender of a text message 1. Select the desired message. Up to 4 phone numbers can be transmitted with a message. 1. Select the desired message. If the message contains a number, the connection is established. If the message contains more than one number, select the desired number from the list. 3. 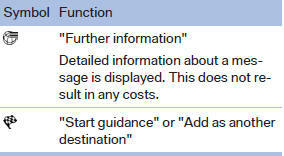 Start destination guidance, if necessary. 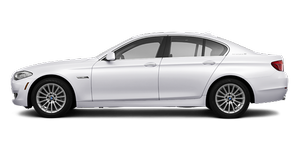 Messages from BMW regarding service actions and news from BMW.